for her engagement. 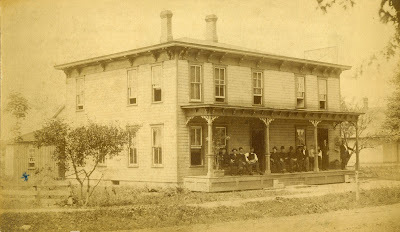 Conneaut, Ohio, circa 1884. Known for her generous heart and her delicious pies, Mary Jane McGinnis held a special place in the memories of her descendants who knew her. My mother, Joan Joyce (Schiavon) Huesca, was sent by her parents, Ralph and Alice (McGinnis) Schiavon, to live with Mary Jane, my mother’s maternal grandmother, when she was about 3 years old. It was the middle of the Depression, and her parents could not afford to care for both her and her brother, Tom Schiavon. My mother remembered “Grandma McGinnis” with great love and respect, especially the way she never turned anyone away from her door hungry or cold. At the time, Mary Jane’s sister, Lyle Gaffney, lived with her and my mother. 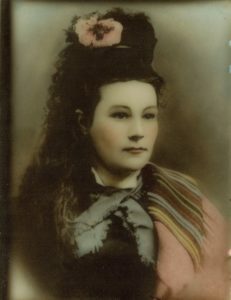 Mary Jane, known as “Janie”, was the eldest of ten children born to John Francis Gaffney and Bridget (Quinn), Gaffney, both Irish immigrants from Drumbrick and Cootehall, Ireland, respectively. She arrived in the world on December 2, 1858, in Milwaukee, Wisconsin, and was baptized at the Cathedral of Saint Mary in that city. The family moved shortly after that to Conneaut, Ohio, where John made a living as a peddlar, according to the 1860 United States Census. He and Bridget saved their money and were able to buy a large residence that was big enough to house their growing family and rent out rooms to the men who worked on the burgeoning Nickel Plate Railroad nearby. Located at 51 Mill Street in Conneaut, the home became variously known as the Gaffney House and the Conneaut House. And yes, their family grew: Nine more children would come along: Margaret, Elizabeth (“Lyle”), Delia, John, Frances, Thomas, Agnes, Clara, and Edward. The two youngest children died in infancy. Jane (McCormick) Olson, daughter of Mary Jane’s and Thomas’ eldest child, Benita (McGinnis) McCormick and another of their grandchildren, recalled Mary Jane describing the way she and the young girls of her day learned Irish step (or “clog,” as it was called then) dancing, noting that long boards would be held up against their spines to train the girls to maintain a very straight posture for this style of dance. One day a young railroad worker by the name of Thomas Eugene McGinnis arrived at Gaffney House to rent a room. Recently returned from several years at sea as a merchant sailor, he had decided to settle down in the Conneaut area, drawn by the promise of a good job offered by the railroad. Checking in with Bridget Gaffney, he was greeted by the divine aroma of a warm and freshly-baked pie. He asked to try a piece, and he found it so delicious that he insisted on meeting the person who had baked it. Bridget excused herself momentarily and returned with her 25-year old daughter Mary Jane. Tom could not believe his eyes as he talked to this young woman. The slender young brunette had deep blue eyes, long, dark eyelashes, a rosy complexion, and a sweet, quiet confidence that intrigued him. No longer smitten by just the pie, he fell in love with her on the spot. Tom and Janie were married a year later on May 19, 1884, at Saint Mary’s Church in Conneaut. Janie, who was not only a superb baker but also an accomplished dressmaker, made her own wedding gown. Her sister Lyle, a milliner, made her headpiece. Tom and Janie moved just down the street from her parents to 78 Mill Street and began their own family. 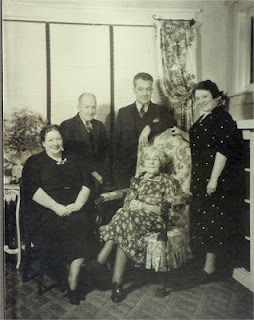 They lost their first child, Mary Margaret, in childbirth, but they went on to have Benita Elizabeth, Francis Eugene, John Charles, and Alice Gaffney, all born in Conneaut. Tom continued to work for the Nickel Plate Railroad until a train derailed near Conneaut, killing several men. Shaken by the tragedy, he decided to move his family to Chicago, where he could find another job. They arrived there sometime between 1895 and 1900. Tom found a job as a cement inspector for the City of Chicago. He built the family’s two-story, Craftsman style family home at 8336 South Drexel Avenue in 1912. Tom and Janie were fiercely devoted to each other throughout their lives, and when Tom died at age 71 in 1927, everyone thought Janie would die soon after of a broken heart. Sustained by her Catholic faith and her love for her five grandchildren, Jack (John McGinnis’ son), Ralph and Joan Schiavon, and Buddy and Jane McCormick, Janie McGinnis surprised them all and went on to live another 13 years, devoting herself to her family and looking out for her siblings, friends and neighbors. Her home was the hub of her family’s lives, and all would gather there every Sunday afternoon to share a delicious meal and hours of stories, songs, and laughter. Besides her baking talents, my great-grandmother Mary Jane was remembered for keeping a pristine home and was expert at the domestic arts so valued at the time. She made many lovely clothes for her children and grandchildren, including my own mother. She taught my mother to love sewing, especially embroidery. My mother loved the creative outlet she found in sewing. She went on to become an accomplished seamstress herself and taught my sisters and me to sew so that you could never see the stitches in a garment. I was quite proud of this accomplishment and always credited it to my mother and great-grandmother. The pie-making was another story. Mary Jane was said to make pies with just the right flakiness, warm and light and picture perfect. After so many stories about those wonderful pies, I was certain that her talent would have to rub off on me. I was determined to be just as good a pie baker as my great-grandmother. Unfortunately, I would find out that I was not to inherit the pie-making gene, though I tried in vain to learn every secret technique for baking pies to perfection. To this day, my pies are more crunchy than flaky, the filling is fair at best, my attempts at crimping the edges are clumsy, and the edges themselves almost always fall off the pan before the pie is even done. Thankfully, my family still eats them, and no one has died from them yet. I have had to learn through fits and starts that I will never be a domestic goddess in the tradition of the Gaffney women, though I hope I at least get points for trying. On the other hand, my sisters have the Gaffney gene, especially my youngest sister, who is known for her delicious meals and baked goods. These seem to come naturally to her, as do those long Gaffney eyelashes. Interesting point about the clog dancing lessons. That seems to be making a come-back, and I can see where the boards would make sense as a training reminder. What a slice of history this story of your generations has journeyed through! Thanks for your comment, Jacqi. I remember Jane talking about how difficult a dance this was to learn. Hearing about all the discipline involved in learning this dance has helped me appreciate it all the more. What a lovely tribute to your great-grandmother! Those photos are so fun too! Mary Jane was a very beautiful and accomplished woman. And the Gaffney House certainly is grand! Is it still standing today? Thanks, Jana. Yes, from all accounts, she was quite a remarkable lady. Her children, too, were just as fascinating – and some of them were "larger than life." I don't know whether the Gaffney House is still there, but I hope to go to Conneaut some day to search for it and the other tracks of the Gaffneys and McGinnises.